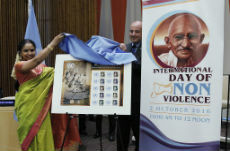 On the birthday of the Mahatma, 2nd October, declared as International Non-Violence Day, the United Nations UN Postal Administration unveiled a commemorative stamp of Bharat Ratna late M.S. Subbulakshmi to mark the 50th anniversary of her performance at the UN in 1966. Sudha Ragunathan. had the honor of receiving the first copy and this was followed by a concert that featured numbers that were favorites of the Mahatma. Sudha Ragunathan also gave six concerts across the U.S. in September 2016. Organized by eye care institution, Sankara Nethralya, these concerts were held in cities such as Atlanta, Chicago, Dallas, Los Angles, Houston and Washington. These were held as part of the centenary celebrations of MS Amma. October 2, 2016 would be firmly etched not only in the annals of Carnatic music but also the archives of the United Nations for remembering and celebrating two legends, the proud son (Mahatma Gandhi) and daughter (MS) of Mother India. “I am indeed blessed to be a part of this indelible imprint,” says Sudha Ragunathan.